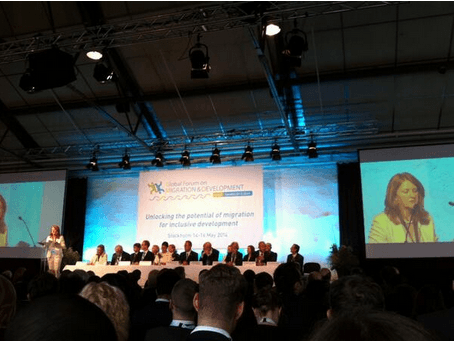 Ending child immigration as an “achievable priority” and implementing child and family-sensitive alternatives to detention (ATD) was highlighted as a priority at this year’s Global Forum on Migration and Development (GFMD) held in Stockholm, Sweden. The Global Forum on Migration and Development (GFMD) is an annual migration conference held by states with the assistance of the Special Representative of the Secretary General on international migration and development, and chaired each year by a different state. Children, who make up 33% of all migrants globally, were a central focus of this year’s GFMD discussions. IDC members and society partners also called upon states to uphold their rights obligations with regard to the non-detention of children. GFMD Civil Society Chair and Director of the Platform for International Cooperation on Undocumented Migrants (PICUM), Michele Levoy, in her plenary speech to over 900 state, inter-governmental and civil society participants, highlighted that “The administrative detention of children is always a child rights violation” and called upon states to explore, develop and implement rights-based ATD as a matter of priority for children and families. 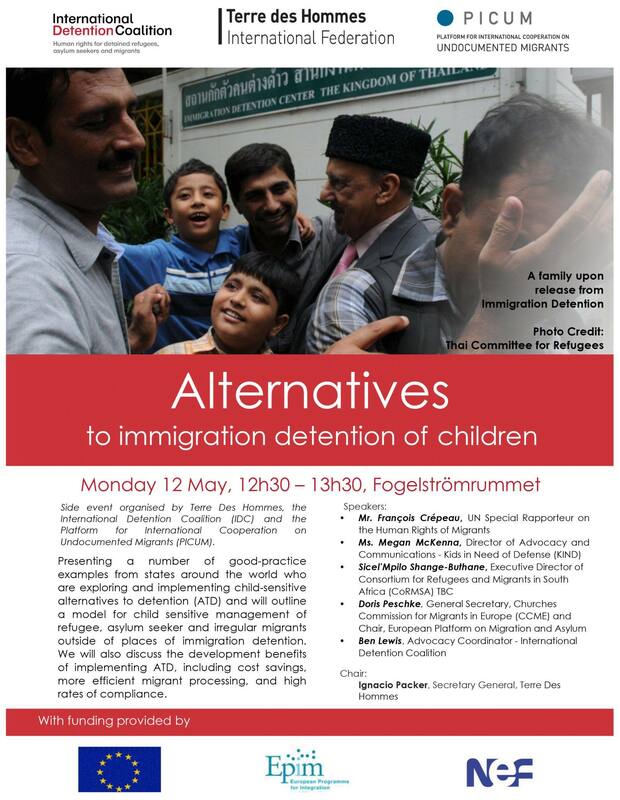 Throughout the GFMD’s two Civil Society Days, the IDC and partner organisations hosted information tables on child rights, with a focus on ending child immigration detention, and sharing videos from our Global Campaign to End Child Immigration Detention. The IDC, together with partners Terre des Hommes (TDH) and PICUM, hosted a Side Event during the GFMD Civil Society Days featuring Mr. François Crépeau, UN Special Rapporteur on the Human Rights of Migrants. The side event, which had over 50 attendees, focused on exploring, developing and implementing ATD for children and families. GFMD Civil Society Days thematic session 2.A on “Protecting and empowering migrants in distress, in transit, at borders and in detention” included discussion on ending the criminalisation of migrants, particularly for children and migrants in distress. GFMD Civil Society Days thematic session 2.B on “Protecting and empowering children in contexts of migration” highlighted the need to respect child rights in the context of migration, including the CRC Committee’s guidance that children should never be detained based upon their or their parents’ migration status.